The content of a sale can be modified while the sale remains unconfirmed. While unconfirmed you can add any products that the buyer has expressed an interest in, print a line sheet, gather customer details etc. The Order Area is located at the bottom portion of the Sales Order screen. In this section, you will add the products your customer wants to order. You can click on the "add products" link below or click on the plus sign (+) in the top right corner of this area. On the next screen you can filter by Season or product category. You can also "search" for a specific product. 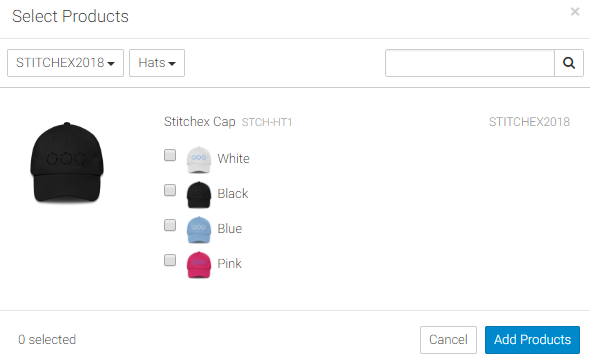 Once you find the products that you want included in the order, click in the boxes to the left side of the products. Then, click the "Add Products" button. In the example below, the White and Blue caps were selected. You will see these populated on the order section of your screen. The next task is to enter the quantities for each size of the product as illustrated below. These quantities are not fully accepted until you click the "Save Changes" button as displayed in the bottom right of the screen. You will know your changes are "Saved" when you see the Sub-total column properly calculated. In the example below, these changes have not been saved so the Sub-total still has zero. Use the to delete a product from the sale.